The employee (aka cast) culture at Disney Parks fascinates me – specifically the characters. I seem to only remember the fully costumed characters when I was young and visiting Walt Disney World. You never actually saw a real person. But times, and culture, have changed. Now there are real life people portraying the Disney characters in the park, which creates an entirely different dynamic for interaction. I never used to hear the characters make any sounds (especially speech) at all. Now you can have an entire conversation with them. The added fascination for me is the fact that now the real-life characters need to work harder to remain in character. They can no longer hide behind the comfort of being silent and not being seen and can simply use body language to remain in character. It’s just fascinating – which probably explains why I have a degree in psychology. 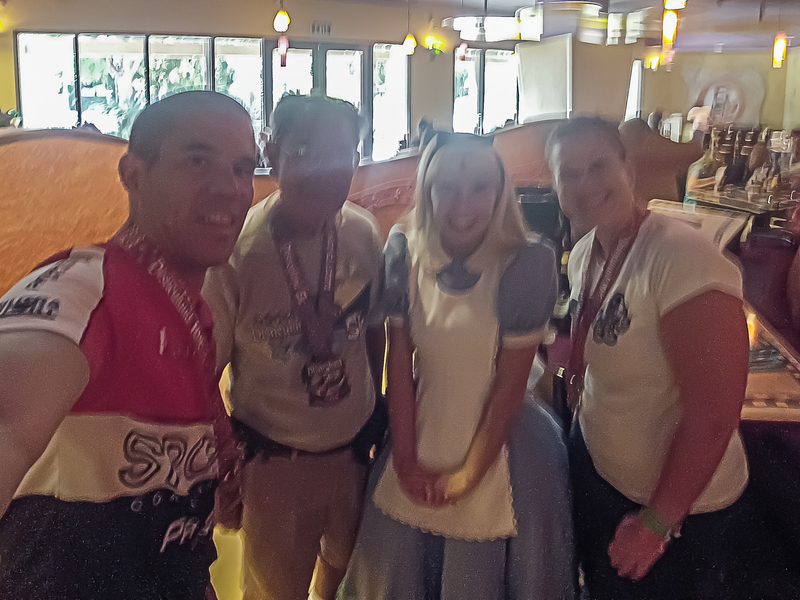 btw – this photo is horrible, but Alice is the one who prompted this post and this is the our selfie with her (which is technically really a “groupie”). So we asked Alice if she knew what a selfie was. She responded “Why yes, a self-sufficient photograph.” Awesome.